Korea is the 5th most important source of visitor arrivals for Thailand, after China, Malaysia, Japan and Russia. It is one of six countries that generate more than one million arrivals a year. In January – April 2013, Korean visitor arrivals to Thailand totaled 436,516, up 17.58% over the same period of 2012. In 2013, the Tourism Authority of Thailand is projecting 1,202,900 Korean visitor arrivals, generating an estimated Bt47,290 million in tourism revenue. Source: Immigration Bureua, Police Department. In 2012, visitors from Korea stayed an average of 7.64 days, while their average daily expenditure was Bt4,811 (or US$154.81) per person. This generated about Bt42.39 billion (or US$1,364 million) tourism exchange revenue to the Thai economy. • 43% were female, up 12.40% to 496,764 while male visitors were up by 17.45% to 656,693. • 54% were first-time travelers, up 12.64% to 629,350, while repeat visitors were up by 18.47% to 524,107. • 49.78% were independent travelers, up 16.43%, while visitors traveling by group tour were up by 14.04% to 579,317. 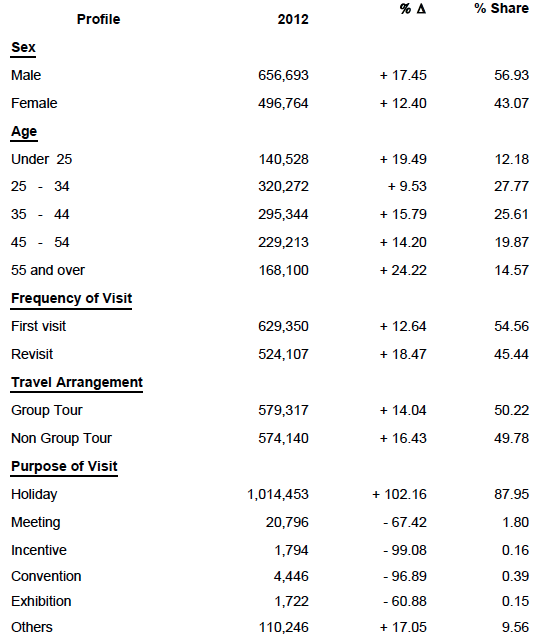 • In terms of age groups, visitors were mainly between 25-34 and 35-44, up by 9.53% and 15.79% respectively. Other fast-growing segments were young people aged under 25 (up by 19.49%) while senior citizens aged over 55 were up by 24.22%. • By purpose of visit, 87.95% were holiday visitors, up by 102.16% to 1,014,453. Source: Department of Tourism, Ministry of Tourism and Sports. Marketing Database Group, Tourism Authority of Thailand. 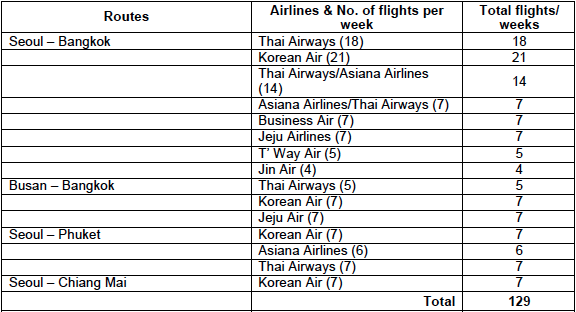 As of June 2013, there were 129 direct scheduled flights between Korea and Thailand, operated by 7 airlines including Thai Airways International (TG), Korean Air, Asiana Airlines, Business Air, Jin Air, Jeju Air, and T’Way Air. Of these, 83 flights are between Seoul and Bangkok, 19 between Busan and Bangkok, 20 flights between Seoul and Phuket and 7 flights between Seoul and Chiang Mai. • In 2011, the top-five Thai destinations for Korean visitors were Bangkok, Pattaya, Chiang Mai, Phuket and Hua Hin. • Korean visitors to Thailand were once dominated by family groups, honeymooners, and golfers but today, the profile includes long-stay travelers, those seeking medical treatment and study-trips. 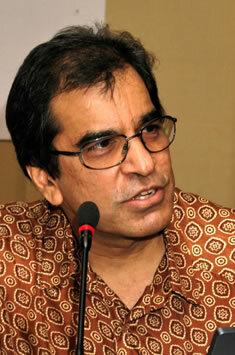 They are also traveling more independently and seeking new experiences. • Korean citizens get 90 days visa-free to stay in Thailand. • Korean visitors see Thailand as a good short-haul destination. Their popular traveling times are during July and August, which goes a long way towards boosting business during what is considered to be a low season period. • Good weather conditions are favorable for golfers. The availability of a huge number of Korean restaurants in all the popular tourist cities adds to the appeal, especially amongst elderly Korean visitors. • One interesting new development to cater to the Korean market is the opening of products such as the exhilarating Nanta Cooking dance performance at the Royal City Avenue (RCA) theatre. It is well worth seeing. • Many charter flights are also being launched to supplement the existing capacity provided by the regular scheduled flights. Bangkok is the most visited city in the world by international tourists, while London stays behind by less than one percent, says the Global Destination City Index.Nevertheless, Bangkok does not make the most profit from its tourists. New York receives 4 million less foreign visitors per year, but altogether tourists still spend considerably more money while they are there. But the most expensive travel destination is Tokyo, with an average spending of $2,190 per visitor. Southeast Asian tourism has exploded, especially due to the number of Chinese tourists in Bangkok, which has surged to a staggering 83 million per year, as Maxwell Watts reports in qz.com. The usual flight origins are from Singapore, Tokyo, Hong Kong, Kuala Lumpur, and Seoul. Like with other aspects of Thai tourism growth, managing this influx of visitors has now become a challenge. One key issue is the shortage of Korean speaking guides. To address this, the Bureau of Tourism Business and Guide Registration, Department of Tourism together with ASEAN-KOREA Center (AKC) provided a Korean Language Training Course in November-December 2012. Many such activities will be necessary.